She was born in Algiers,Louisiana June 3, 1897 to Abe and Gertrude Douglas. She was the oldest of 13 children. Minnie's given name was Lizzie Douglas. The family moving in 1904 to Walls in northern Mississippi. The following year Douglas was given a guitar for her birthday and quickly learned to play. She didn't care for her given name too much and eventually became known professionally and personally as Memphis Minnie. A child prodigy, she began playing local parties as "Kid" Douglas before running away from home to play for tips at Church's Park ( the current W.C. Handy Park) on Beale Street in Memphis. During the 1910s and early 1920s, Douglas adopted the handle of Memphis Minnie and toured the South, playing tent shows with the Ringling Brothers Circus. During the late 1920s Minnie began playing guitar with a variety of ad hoc jug bands during Memphis's jug band craze. 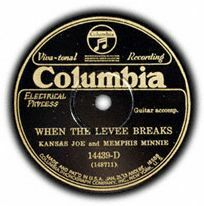 Minnie also began a common law marriage with Kansas Joe McCoy, a musician with whom she had begun playing and would soon record. Their very first session yielded the hit song "Bumble Bee" (later recorded by Muddy Waters as "Honey Bee"), and McCoy would be her musical partner for the next six years. Within a year of her first recording date, Minnie had logged a half-dozen more sessions, including a reprise of "Bumble Bee" with the Memphis Jug Band. Bukka White claimed that Minnie sang backup on his 1930 gospel recordings. By the time the effects of the Great Depression had shackled the recording industry, Minnie had recorded fifty sides that showcased her powerful voice and energetic guitar picking. She affected wealth as her idol Ma Rainey had done, traveling to shows in luxury cars and wearing bracelets made of silver dollars on her wrists. During the 1930s, Minnie moved to Chicago where she set the musical style by taking up bass and drum accompaniment, anticipating the sound of the 1950s Chicago blues. After her breakup with Kansas Joe, Minnie married Ernest Lawlars, known as "Little Son Joe," and continued to record into the early 1950s. Poor health prompted her to return to Memphis and forsake the musician's life in 1958. Memphis Minnie was the greatest female country blues singer, and the popularity of her songs made her one of the blues most influential artists. 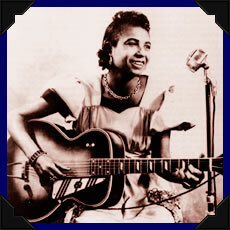 Memphis Minnie died August 6, 1973, in Memphis, Tennessee, and is buried in New Hope Cemetery in Walls, Mississippi.